The past two days of action had led to this moment. 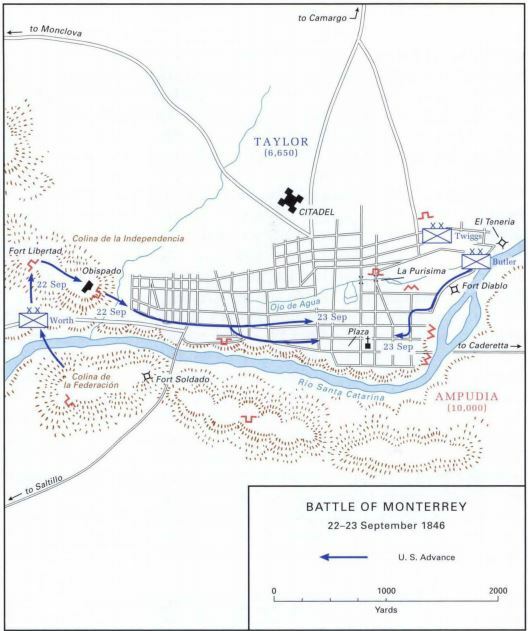 Locked in combat on Sept. 21 and 22, the Mexican and American armies in Monterrey prepared for the final day of fighting. For Zachary Taylor, his lackluster decisions had caused extremely heavy casualties with little to show for it on the eastern side of the city, while his subordinate Brig. Gen. William Worth steadily chipped away at the western approaches. And for Pedro de Ampudia, this was his last chance to beat the American invaders, with his troops ensconced in homes leading towards the city’s central plaza. The stage was set for the grand finale to the Battle of Monterrey. Fighting started on Sept. 23 on the eastern side of the city as Taylor ordered the divisions directly under his command to resume their push into the city. These were the troops who had been torn to pieces on Sept. 21, and they cautiously advanced, finding Mexican bastions empty as they went. It did not take long, though, for the regulars moving towards the center of town to meet opposition. “The fighting was very severe, but nothing compared to that on the 21st,” Captain William S. Henry from the 3­­­­­­­rd US remembered. Captain Henry did have a caveat for the comparison in the fighting on Sept. 21 and 23, however, when it came to crossing streets. Crossing from house to house, whenever the American soldiers came to intersections, they could only count on a mad dash to safety on the other side. In combined-arms, the Americans found ways to cover their fire. 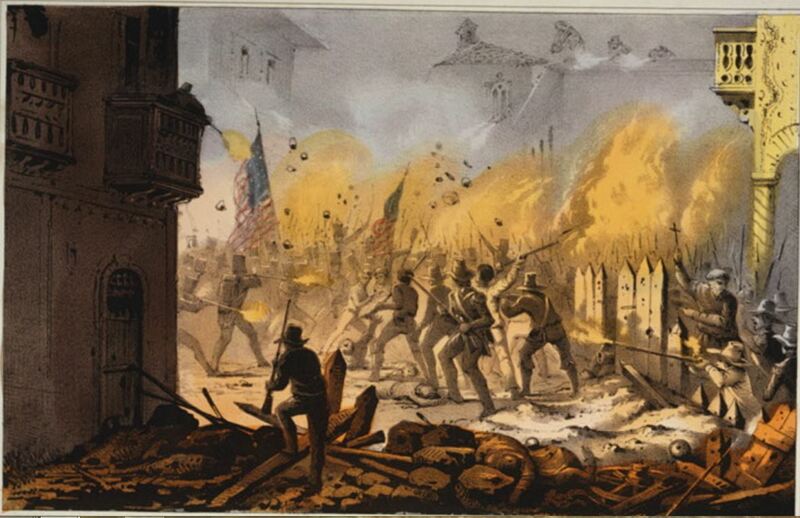 Bringing his battery into the streets of the city, Braxton Bragg fired his guns up into the houses that Mexican soldiers used as small forts. “The Mexicans, whenever the [cannon] was pointed at them, would fall behind their barricade, and at that time we could cross without a certainty of being shot,” Henry explained. But once the Mexicans resumed firing, they “swept the street.” In starts and stops, the Americans leapfrogged from intersection to intersection. Casualties were lighter among the attacking forces because they had learned their lesson two days earlier. The Americans no longer attacked straight up the claustrophobic streets, but rather attacked through the houses lining the roads. Pummeling doors down, American soldiers would breach-and-clear the homes, sometimes throwing lighted cannon shells into the rooms like improvised grenades. The house-clearing in Monterrey in September 1846 was undertaken by the American army on a scale never seen before by the American military. Taylor’s soldiers truly were making it up as they went along. The two separate American columns pinched deeper towards the center of Monterrey. Batteries of cannons, howitzers, and mortars bombarded the Mexican plaza creating a cacophony of noise and smoke. Muskets popped and crackled like dry brush burning. Taylor, getting Ampudia’s terms, ceased operations against the city. Both sides would appoint commissioners to go over the finer details, but the battle was over. Monterrey had fallen. This series on the Battle of Monterrey concludes on Sunday, Sept. 25, with the 170th Anniversary of the formal surrender of Monterrey. William S. Henry, Campaign Sketches of the War with Mexico (1847), 207. Abner Doubleday, My Life in the Old Army: The Reminiscences of Abner Doubleday, Edited by Joseph F. Chance (Fort Worth: Texas Christian University Press, 1998), 92-3. Ulysses S. Grant, Personal Memoirs of U.S. Grant: Volume 1 (New York: The Century Co, 1895 edition), 87. Zachary Taylor, Letters of Zachary Taylor: From the Battle-fields of the Mexican War (Rochester: N.p, 1908), 61. 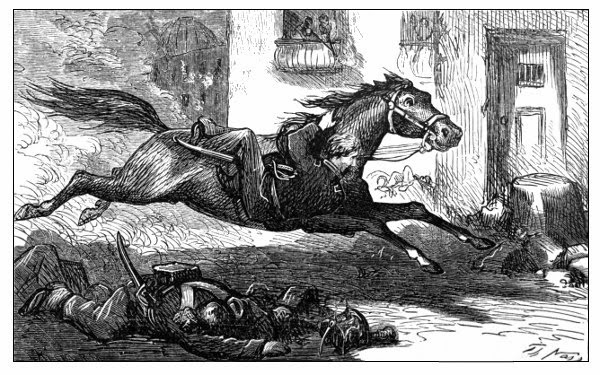 Cadmus Wilcox, History of the Mexican War (Washington, D.C.: The Church News Publishing Company, 1892), 108. This entry was posted in Armies, Battles, Mexican War and tagged 3rd US, 4th US, Abner Doubleday, Battle of Monterrey, Charles Hoskins, Pedro de Ampudia, Ulysses S. Grant, William J. Worth, William S. Henry, Zachary Taylor. Bookmark the permalink.